Replacement graphic for the Allure™ Slope Left Banner Stand. 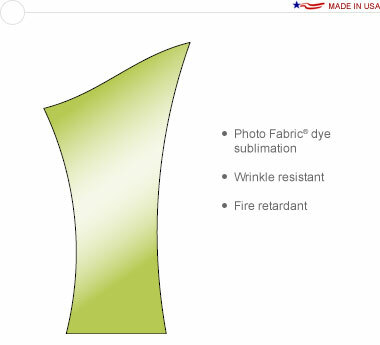 The fabric tension material is a high-strength, premium nylon that is machine washable, wrinkle resistant and fire retardant. Allure™ requires no tools – simply connect the graphic to the frame. One person can set up this banner display in less than two minutes. There is a full selection of Allure™ accessories components available to tailor this banner stand to your unique marketing needs. The flat shipping rate is $21.10 USD for standard delivery within the continental United States. Alternative shipping methods and International shipments are available. Volume pricing is available for large quantity orders (5+) of this item.